HP has produced an impressive laptop with the Spectre. It looks edgy, it feels sturdy, it performs well, and it’s very portable. It’s an important Windows machine partly because it can compete with Apple’s 2016 MacBook. But it’s not perfect, unfortunately. Battery life is short. And in certain cases the fan gets very loud, even when the computer has been tasked with lightweight work. The machine can get so hot that it’s uncomfortable to hold on your lap. Perhaps this is unavoidable for the thinnest laptop in the world. There are simply going to be sacrifices. Above: It’s thin, all right. The thing is, this is an expensive laptop — it starts at $1,170, which is $129 less than the MacBook. There is no touch or inking capability. It’s not a convertible tablet. That’s OK — a laptop can just be a laptop — but it will be limited in its appeal in comparison with other Windows machines. The build quality, size, and style. Some might call the Spectre a work of art. I like its svelte look, the shiny, sharp-edged copper on the back that houses the USB-C ports and headphone jack, and the copper hinges that connect the base of the computer to the display. They look like a pair of earrings, but they actually do a great job of keeping the display sturdy — it doesn’t bounce a lot as you type, unlike, say, Microsoft’s Surface Book. 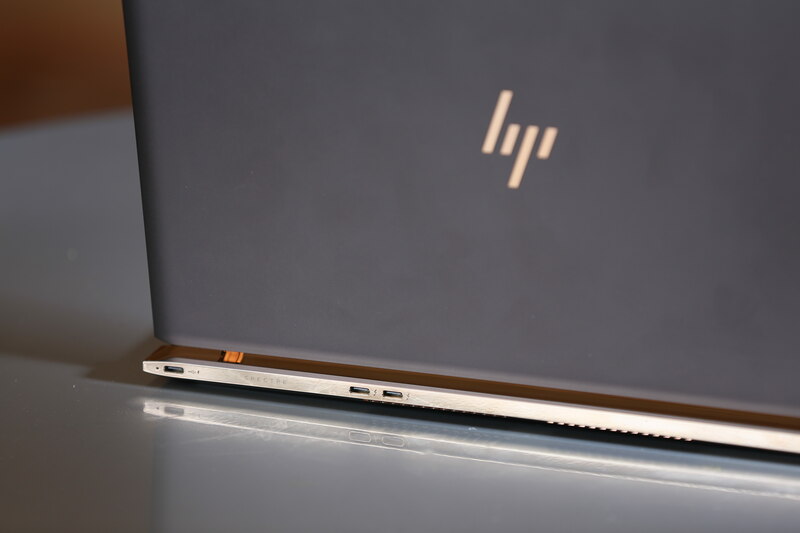 And it doesn’t much resemble any other HP laptop — it’s a new design. But the real attraction here is the size. 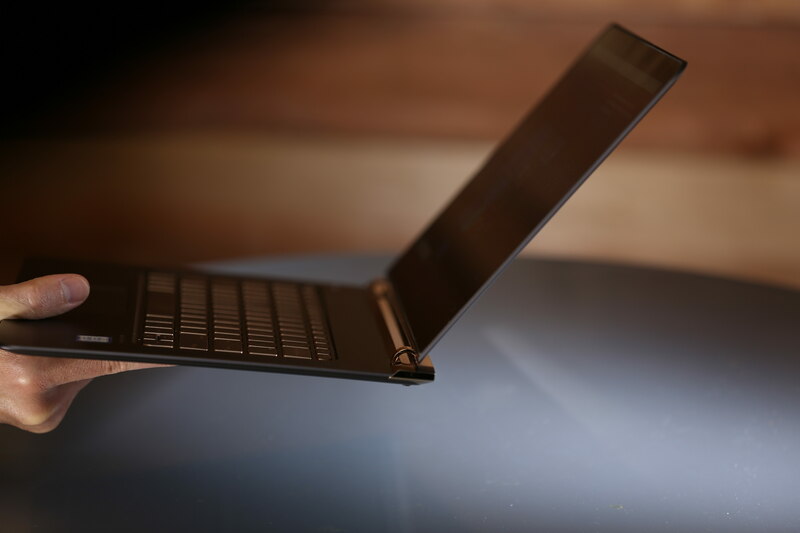 HP says the Spectre is the thinnest laptop in the world. It doesn’t feel a lot thinner than the MacBook to me, but at 10.4mm, it is 2.7mm thinner than the MacBook at its tallest point. The hard plastic base is fine. It’s not copper. As much as it might look nicer if it were copper, it does prevent you from getting burned when the chip is running hot. On the other side of the display, you’ll find a few diagonal copper lines that together form a slick version of an HP logo. It’s the logo that HP is using now on its premium devices. Above: Get a look at that keyboard. The performance. The Spectre stands up very well to Minecraft, and it also does a great job with workloads that are more typical for me, like web browsing, word processing, and video streaming. A big pile of Chrome tabs is no match for the Spectre. 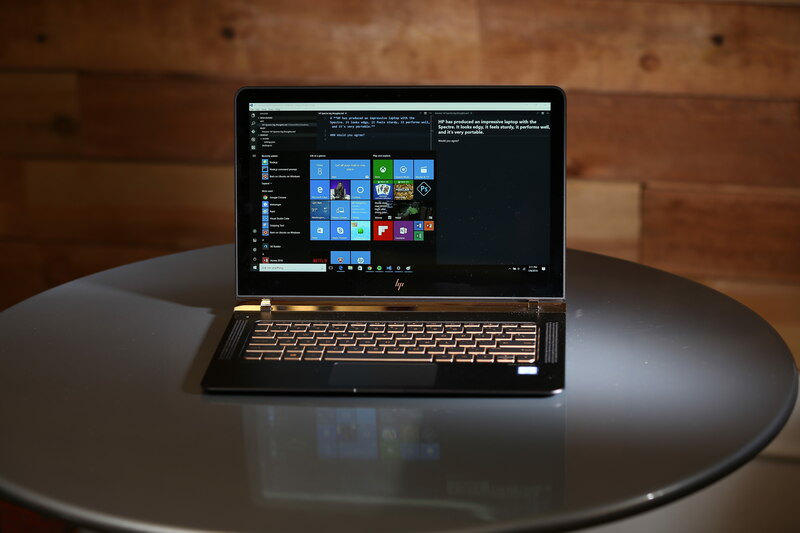 I chalk up the performance to the sixth-generation Intel Core i7 chip and integrated Intel HD Graphics 520 graphics processing unit, with 8GB of RAM. (As configured, the model I tested costs $1,250; the base model with a Core i5 chip costs $1,170.) With those components the computer certainly gets a lot done, but you’ll hear it. “Sounds like a radiator, that computer,” one of my editors said one day while working a few feet away from me. The display. 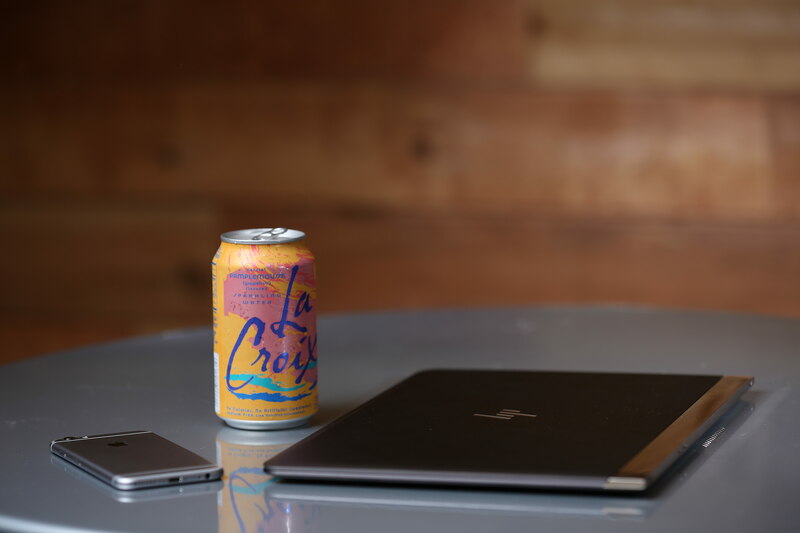 The laptop’s 13.3-inch FHD display looks very clear and bright, and it’s noticeably bigger than that of the 12-inch MacBook — one reason that it weighs almost half a pound more, at 2.45 pounds. Still, it’s light enough that you can forget you’re carrying it in your bag. The keyboard. Just like the EliteBook Folio G1 from HP, the springy keys on this Spectre go down a good bit more than the ones you get on the MacBook. I can type pretty quickly. The ports. It’s great having three USB-C ports on the Spectre. You don’t need to carry around a dongle if you simply want to charge your phone while you’re charging the laptop. Above: Three, count ’em, three, USB-C ports. Two of the three ports support Thunderbolt 3, meaning that you get high-bandwidth video connections to DisplayPort external monitors. That feature is missing from Apple’s 12-inch MacBook. The storage. With a 256GB solid state drive, this laptop has a decent amount of room to store your files — the same amount as the entry-level MacBook. 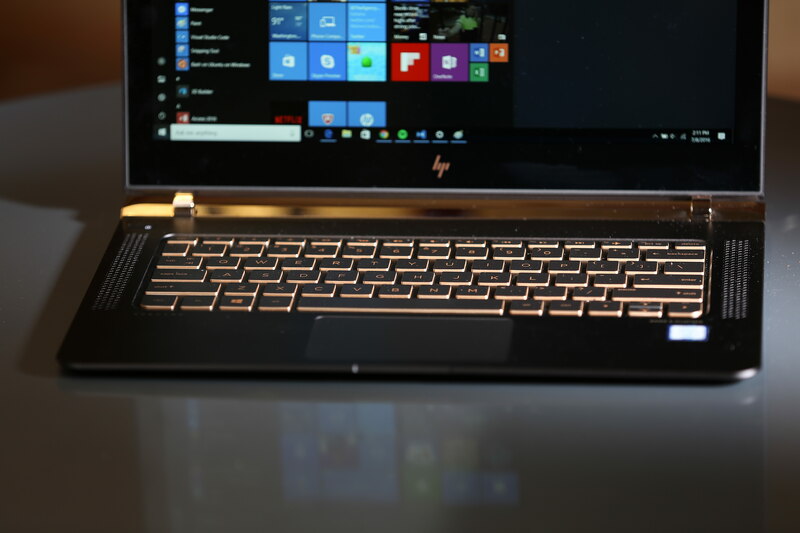 But while HP has succeeded in capturing the “thinnest laptop” award with the Spectre, the company definitely made some trade-offs. Here are some things I don’t like about the laptop. The battery life. While HP says the Spectre’s battery will last up to 9 hours and 45 minutes, in my testing the battery usually lasts between two and four hours, which is not enough to get through a day of work, at least for me. This is probably the laptop’s largest drawback. Above: The HP Spectre’s battery lasts between two and four hours in my testing. The speakers. The front-facing speakers to the left and right of the keyboard, while reasonably loud, emit a treble-heavy sound that’s not as impressive as the audio you get out of the bottom-firing speakers on the EliteBook Folio G1. The trackpad. As is the case with most Windows laptops, this one doesn’t have the most accurate trackpad. You can get by with it, and multi-touch gestures work pretty well, but I prefer to use the Spectre 13 with a mouse. The camera. The 720p camera is a bump up from the 480p camera on the MacBook, but it’s still a bit grainy. No touch, no Windows Hello. Nuff said. So, altogether, HP has an imperfect device here. But I have to say, I like it a lot. The short battery life makes me hesitate to bring it to events where I don’t know for sure that I’ll have a reliable power connection, but other than that, it’s a solid daily computer. Altogether, it’s more performant and aesthetically appealing than HP’s EliteBook Folio G1, it’s easier to take around than HP’s 13-inch and 15-inch Spectre x360 or Dell’s XPS 13, it’s not trying to do too many things like the Surface Pro 4, and it’s cheaper than the MacBook or the Surface Book. It’s one of the more promising Windows laptops of the year, even with its flaws. So if you’re thinking about buying a new laptop and you’re OK with dropping more than $1,000, the Spectre is worth a look. Track HP’s Landscape to stay on top of the industry. Access the entire ecosystem, track innovation & deals. Learn more.